Every house comes with one, so do apartments, barely, even though some may not be much bigger than your closet. Their function and purpose is as a place to prepare sustenance for oneself and one's family and friends. I'm talking about the kitchen in one's life. Nowadays, there are so many "makeover" shows where we are able to see how other people live, and when one spots a fabuously made-over kitchen, all brand spanking new, we want one too - after all, it's where most of us spend much of our time. Remodelling a kitchen can transform the rest of the living area and is a big investment. This superb book looks at the many different aspects you'll need to consider when thinking about updating your kitchen. Whether it's an old-fashioned kitchen or an ultra modern one, or even just something different for a change, this book has loads of ideas and some really wonderful ones can be found in the many photographs - lighting, finishes, surfaces, appliances, color, islands or not, utensils, and chairs - look at the details. The idea of "how long will it last?" on page 32 gives you an idea of how long faucets and floors and more should last you. Whether you desire a gourmet kitchen or just a functional cooking space, there are ideas to suit almost everyone's imagination and pocket. Not all of us are likely to encounter Nate Berkus in our lifetimes. I liked the kitchens on page 49 (lower), pages 120/121, 165, the fun on pages 236/237 but the one on page 207 scares me a little. This book really does have everything including the kitchen sink, plus stories from some well-known cooking personalities too. There's even a budget planner list to help you. 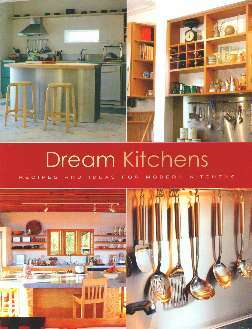 Dream Kitchens may be purchased and/or ordered through your local bookstore. Conclusion - Most suitable for anyone wanting to update or change their kitchens.